Community Engineering Corps » Join us at ACE19! On behalf of AWWA, EWB-USA, and ASCE, you are invited to attend our event celebrating the 5-year anniversary of Community Engineering Corps during the AWWA ACE19 event. ACE is AWWA’s annual gathering of water industry professionals, and this year it is taking place in Denver. 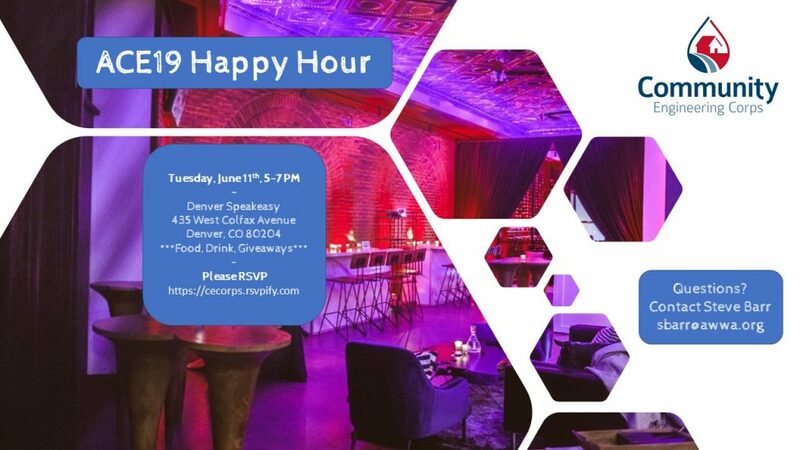 We hope that conference attendees and all volunteers with the Community Engineering Corps can attend our happy hour event, where we will celebrate the successes of our volunteers in making a meaningful impact on underserved communities through engineering. If you’ve never participated in CECorps and would like to learn more, please attend and get to know our staff, volunteers, projects, and hear about upcoming programs. Registration for ACE19 is encouraged but not required for attendance of this event. Business casual attire. Questions? Email Steve Barr at sbarr@awwa.org.